Name that tune's writer. 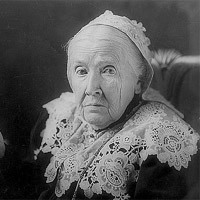 It's "The Battle Hymn of the Republic," written by author and activist Julia Ward Howe. Howe became the first woman elected to the prestigious American Academy of Arts and Letters on January 28, 1908.